See the situation through the other person’s eyes. You’ll be able to change their mind easier if you know exactly where they are coming from. Ask questions to clarify what they are saying. Don’t let your mind wander. Listen for the main idea so you can make sense out of what they’re saying and respond correctly. Part of loving a person is enjoying them. Care about what they care about. Look at the person who is talking to you. Don’t be distracted by other things. Stop what you are doing. Don’t be impatient, shaking your leg and wanting to be out of there. Paraphrase occasionally to make sure you understand what they are saying. Create an environment where your spouse feels safe and loved and not judged. Treat them how you would like to be treated. 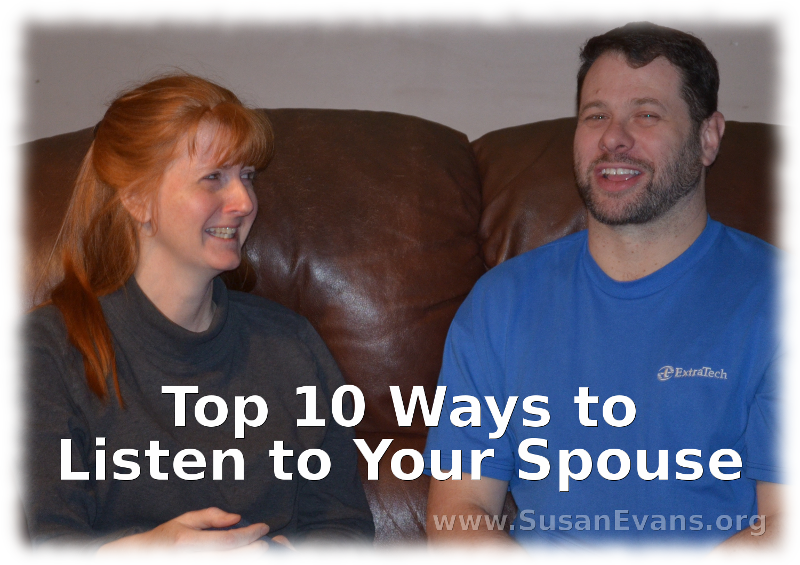 Listening requires time and effort, but it’s worth it because you end up with a greater oneness in your marriage. Linked to Sheila Gregoire’s blog hop. This entry was posted on Monday, February 11th, 2013 at 8:00 am	and is filed under Marriage. You can follow any responses to this entry through the RSS 2.0 feed. You can skip to the end and leave a response. Pinging is currently not allowed. Great tips and it’s always useful to get a reminder of ways to listen. These are really useful, especially as my husband and I communicate with each other in a second language (either Thai or English, depending on the conversation), so we need to be careful of not misunderstanding each other. When you speak multiple languages, communication can get even trickier! great post and soooo, soooo, soooo important. When my husband and I were both working, it was very easy for us to talk to each other b/c we were in similar situations all the time. Now that I’m a stay at home mom and he’s working, I find it even more important to make a point to talk to each other and really listen b/c we’re in such different worlds now! <3 Thanks for the advice. It’s harder to come up with interesting topics of conversation if our whole day is spent at home with the kids, and if our husbands want to talk about something other than the kids. I’m just saying that it was way easier for me to talk to him about my day back when I was a teacher before I had kids.